I don't know about your husband, but mine is a really hard person to please. Project after project gets completed and he says "That's Nice." Sometimes it is worse than that. When I show him pictures of new designs, he gives his opionions, or in other words, tells me how to make changes and why I should. I DON'T LISTEN VERY OFTEN. I do have to say though, that the inspirations for "A GIRL'S BEST FRIEND", the diamond ring shape was his idea. Back to the point at hand. We just finished sewing a new Ellie Bag. 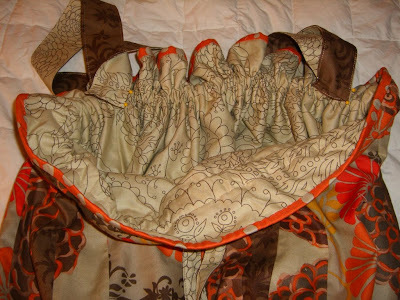 We used Free Spirit Fabrics. We love artsy designs. It is also in some of our favorite colors, orange and brown. Now, my husband hates the color orange. 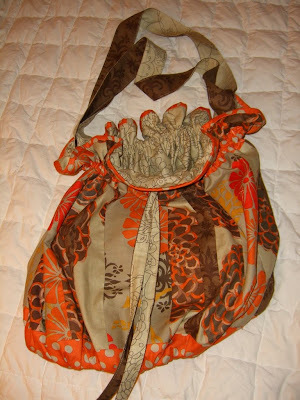 So, I showed him the bag in progress and to my surprise, he said "Wow, I really like it." I am still in shock. 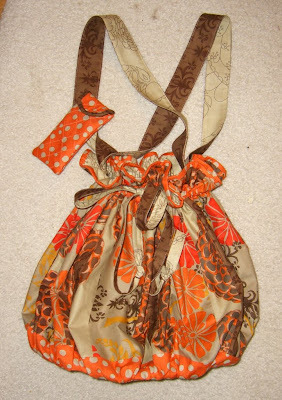 He then added, "I don't like the orange polka dot fabric though, but the rest of it is nice." He went on to put in his two cents on which fabrics I should use for the handles. I didn't listen. 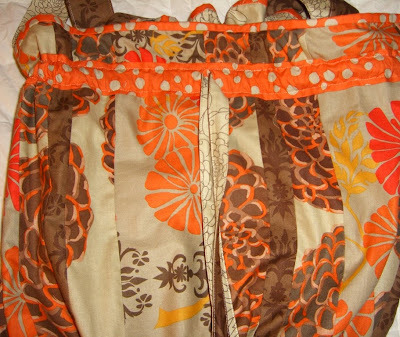 After all, the orange polka dot was my favorite of the fabrics. So, I will let ya'll issue your own opinion. Here are a couple of close-ups. Notice that the ties and handles are two different fabrics. Here is a shot of the different stripes of fabric that make the bag. The combinations of fabrics are endless. Check out the cute inside fabric. 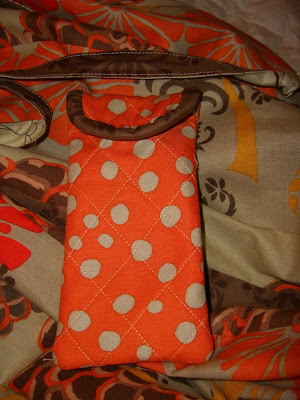 And don't forget the little glass case made out of the adorable orange polka dot. As the title states, "He loves it, He loves it not." Where my husband loves it not most of the time, Janice's husband, Kevin, loves it all. He even helps in quilt design, usually fishing or hunting themes. Janice's husband does provide a great service for Abbey Lane Quilts. He empties Janice's Abbey Bags. He is constantly checking to make sure all three of Janice's Abbey Bags have the scraps and strings emptied to the garbage. I am constantly trying to get him to offer this service to the general public, but no luck so far. I hear Bribery might work. Please send all reasonable offers. How hilarious! At least your hubby is being honest. 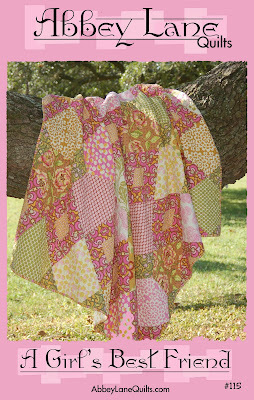 And wow, I'm sorry I turned down your offer for a free pattern, because I love the Diamond quilt!!! How's the blog site coming?? Have you seen our website? www.abbeylanequilts.com. fyi, carolee is janice's daughter and one of our biggest contributors. I guess three boys is getting to you. The diamond quilt is one of our favorites and as you can see, i still have no background, but we have made a couple of changes. Send us your address, cause that free pattern, i believe you want "A Girl's Best Friend" is waiting. Marcea, maybe given enough time your husband will learn to love polka dots, that is one of my favs in the bag too. Janice, we live close, do you think I could get Kevin to empty may abbey bag. Good job training him. 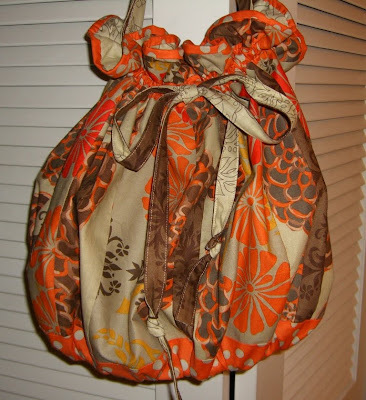 I don't have one of your lovely bags but I do have a small brown lunch sack taped to the corner of my sewing table for my scraps/thread ends. My Sweetie cleans it out when he rounds up the trash and he checks to make sure something hasn't gotten in it by mistake. Last week he found a bobbin had dropped in for a visit. I was delighted that he found it before it went to the dump!